Canadian Prime Minister Justin Trudeau, right, and 23-year-old Breanne Lavallee-Heckert, right. The realities of gender equality are often described as "gaps," illustrating the rift that exists between a world where women and girls are valued equally and the world we live in now. The wage gap refers to the disparity in annual earnings between men and women (in Canada, women still earn 74.2 cents for every dollar that full-time male workers made). The confidence gap refers to evidence that indicates women are less self-assured than men, and far more likely to self-doubt. Every girl has a dream, but all too often they are held back. I'd like to introduce a new "gap" to the vernacular — the "dream gap." This gap refers to the combination of barriers that deny or impede girls from achieving their dreams and realizing their full potential. Every girl has a dream, but all too often they are held back by harmful gender norms, discrimination and lack of access to rights — including education, health and protection. Girls are inherently powerful, but around the world they are routinely denied the opportunity to be heard and realize their dreams. Girls Belong Here participants exploring the barriers that too often hold girls back. Plan International's latest report, Unlock the Power of Girls Now, builds on the organization's research over the last decade, which found that girls worldwide want to take control of their lives, but violence and discrimination keep them suppressed and powerless. Here in Canada, we recently conducted a perception-based survey on gender-related barriers. One in four people in Canada feel their gender has been an obstacle in attaining their goals, dreams and career aspirations. One in three women expressed having had their authority questioned because of their gender and 58 per cent of women believe the way society stereotypes females is the reason why girls change the way they view themselves. Girls must become visible in places of leadership and influence — like the office of the prime minister. Parents and teachers confidently assure girls "you can achieve anything you put your mind to." Ad campaigns and pop songs reinforce this idea — calling on young women to be #girlbosses and dream big. But we cannot continue to recite these affirmations if we are not willing to help shatter the walls that hold so many of our young women and girls back. We need to dig deep together and uproot the systematic inequalities that prevent gender equality from flourishing. This requires transforming prevailing social norms, attitudes and practices which takes resilience and patience. But it's absolutely worth it. Through the #GirlsBelongHere initiative, Plan International Canada is working to help bridge the dream gap of what girls are capable of and what they're allowed to be. This initiative is part of a global mass initiative (#GirlsTakeover) marking International Day of the Girl, with more than 500 participants in 60 countries. 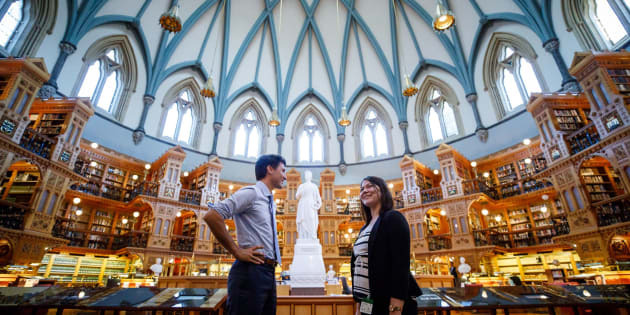 Prime Minister Justin Trudeau and 23-year-old Breanne Lavallee-Heckert in the House of Commons. On Sept. 25, Prime Minister Justin Trudeau accepted a challenge issued by 23-year-old Breanne Lavallee-Heckert on Twitter, asking him to share his office with her to show Canada and the world that girls belong in their dream jobs. On Oct. 5, Breanne shared the prime minister's office for the day, realizing a personal dream and inspiring girls across Canada and around the world. Breanne is one of a diverse group of girls from across Canada who have challenged leaders in a variety of sectors — including politicians, journalists, educators and business executives — to share their role for a day to illustrate every girl's right to realize their full potential. So this International Day of The Girl, don't just tell girls they can achieve their dreams, show them by actively helping to bridge the dream gap. Our goal is a world where women and men, girls and boys can enjoy power with each other, rather than power over each other, and where everyone can draw strength from the power within themselves. No more need for bridges, no more gaps, just equal ground.